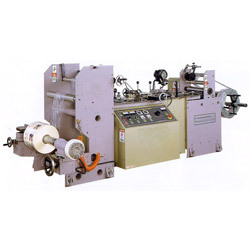 This machine is designed for the production of polycell and colored shrink labels. A DC stepless speed change motor provides variable speeds to accommodate a variety of materials. Easy to operate and maintain. 1. Mechanical speed : 10~100 M/min. 2. Material width: 60~520mm. 3. Unwind dia. : 450 mm (max). 4. Sleeve width: 25~250mm (min). 5. Rewind dia. : 700mm (max).